Hi! We're Dave & Janie Whitty, native Floridians, and we LOVE to go camping and canoeing in Florida! We live in Eustis, FL, a small town in Central Florida about 45 min. northeast of Orlando and about 10 minutes south of the Ocala National Forest. Thanks for stopping by - we hope you enjoy our photos! We try to visit a new State Park on each trip! I'll use this site to share the experience with everyone. I'll include our itinerary, the interesting sites we visited, and the interesting critters we met. Don't worry, there will be lots of pictures! 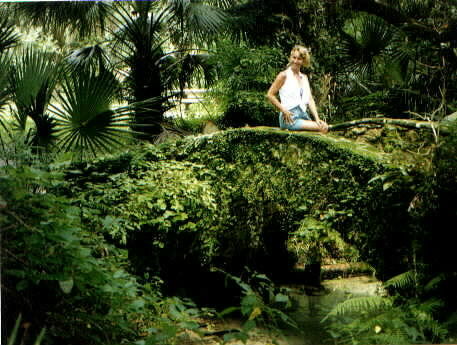 Dave took this photo of Janie sitting on the stone footbridge that leads to the nature Trail at Juniper Springs in the beautiful Ocala National Forest in Florida. Living so close, we often visit other places in the Ocala National Forest. This was one of our favorites. We returned on a subsequent trip for 3 days of camping and canoing the Juniper Creek Run. Please sign my guestbook and leave a comment, too!